If someone were to ask me if I would be happy to find coffee in my stocking this year I would tell them sure. I mean who wouldn't? Well, as long as it's a good tasting coffee that is. If it was Melitta Coffee I would definitely be happy because I've tried several from their line and none have disappointed me. They have a nice robust taste with lots of flavor in every cup. Okay so I know now I sound like a commercial, but I really do enjoy the flavored coffees they offer. I use a mixture of bagged coffee as well as capsules at home. When I'm not drinking alone I will make a pot, but if it's just me I usually only drink a cup or two so I don't need a whole pot. I love that now days we have options when it comes to brewing coffee. Not just the choice between regular and decaf, but also the choice from lots of flavors. 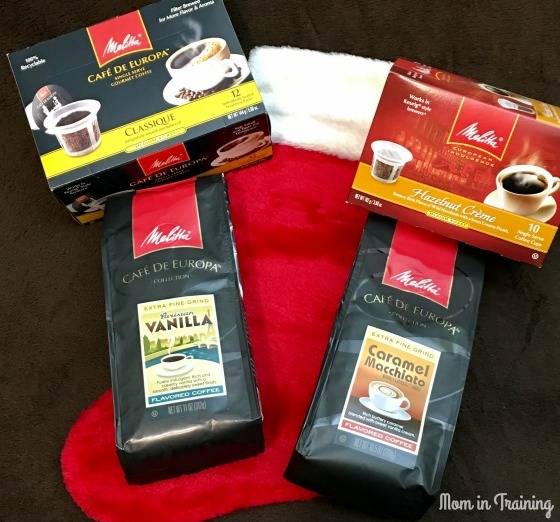 So why not gift the taste of flavor and give someone a gift bag filled with Melitta coffee blends for Christmas this year. I promise they won't be disappointed. What a wonderful selection of coffees they have. I'm not a flavored coffee drinker but I love trying different brands and blends of regular coffee. The perfect gift for me would be coffee too. Melitta sounds like a great coffee I would love to try.